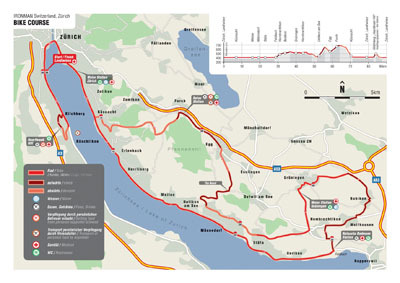 I was lucky to find accommodation in 10 minutes walking distance from the Landiwiese which was the gathering point for the Ironman Switzerland with the transition area and the Finish. The swim course of Ironman Switzerland was spectacular. A two lap course and the two laps were connected with a small wodden bridge that the athletes had to cross at the end of the first lap so that official times could be taken. The swim start was an open water start. We professional athletes were allowed to enter the water about 30 minutes before the masses so that we could warm up for the race. We were all swimming out into the open water accompanied by a motorboat and several Kajaks and a helicopter above us, and then gathered together waiting for the start signal. After a while one of the professional men just started swimming in race pace into the race course, and, we all followed. The race crew had no other option than following us because we had all started the race without a start signal! A few minutes later we could hear the signal for the age group competitors. The swim start was horrible! The helicopter was flying too close to the surface of the water to film us and the wind caused by the helicopters generated very strong waves which made it almost impossible to swim. I can still remember now that I swallowed a huge amount of water and that I needed all my energy just to keep my head over water. There was no way that I could do one proper stroke. I was just fighting not to drown. The lifeguards on the boat realized the danger very fast and they gave signals to the helicopter to keep a distance. The boat accompanied us for a while on the swim course until the helicopter was gone. I did not panic eventhough I had really been struggling very hard to keep swimming. After that bad start I got back into my rhythm and I used the church on the other side of the lake as sighting point to swim in a straight line to the 90 degrees turning point of the first lap. After the first turning point we had to swim in a straight line along the shore of the lake up to the height of the transition area. Then there was another 90 degrees turn and we were swimming towards the transition area. At the end of the first lap we had to swim under a bridge and then run over the small wodden bridge to have our official time taken. In the second lap there were swimmers in two lanes swimming in parallel, the slower age group swimmers who had started after us and the faster professional swimmersb at the end of the second lap! I had a very fast transition from the swim to the bike because my bike had an optimal position directly at the swim exit. In this Ironman race there was no transition tent and competitors kept all the transition bags at the bike in the bike rack. So I changed my clothes next to my bike which saved a lot of time and then I ran with the bike to the transition exit. The bike course was beautiful! 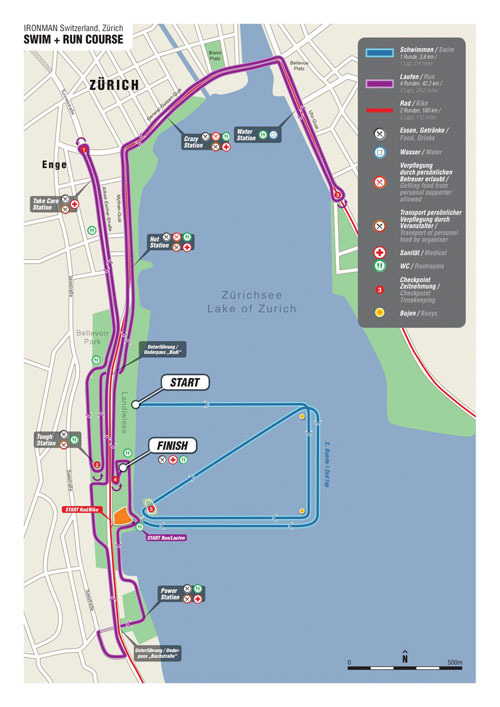 The first 20-30 km of the course were a flat stretch along the lake. Soon after that though we were heading in the Swiss mountains and that was a challenge for the experienced Ironman. and lots of turns that were regulated by the police who stopped the traffic to let competitors pass. Because I was a dedicated cyclist, the course suited me very well and I passed several professional athletes on the course. I had a great position when I reached the transition to drop of my bike and start the run course. I finished in a very good time and I would like to thank Ironman Switzerland and Tempo Cycling Sports for their invitation to race as professional athlete in IM Switzerland and for their support in my preparation for the race and especially during the race.